S4NGH had the most liked content! S4NGH replied to singhunit's topic in WHAT'S HAPPENING? "We now know this person was NOT a Sikh and a turban was not part of his appearance whilst committing these crimes. Suspiciously, he drastically changed his appearance and grew a beard and started wearing a Turban when the investigation first started, he also gained a lot of weight. We can assume this was to hide his identity from victims he had abused around 7 years earlier." Edit: To clarify, Dhaliwal belongs to a Sikh family. He was a mona but took on sikhi saroop when the police investigations begun. always a "sikh" but adopted the singh identity when police investigations begun 5+ years back. dastar, kes, kirpan. Whether he actually took amrit, I don't know. Amere is not his real name. The address he's given is of a rental property and not of his residence. He is married with children. His dad was a womaniser. His mum and sisters are nothing alike. It's well known that "amere" was a dealer; he worked on a factory floor and drove big cars etc etc flaunting his cash. He was a mona up until he got caught out fiddling with kids. He donned the singh image in an attempt to show reform etc. And now he'll become a Muslim in jail to protect his a$$ quite literally. "converted to sikh religion". Lord. Why do people read the dailyfail? especially apne lok. Erm I read. It's readily available. Cowspiracy is a good documentary. Eye opening to say the least. Beere you habing tooo much corex!! Firstly, eggs are basically chicken periods. Yum. Chakho chakho ji. Secondly, the conditions in which chickens are kept. Free range caged organic whatever is pure marketing bs. Chickens in the egg industry live 1-2years. Chickens in nature live an average lifespan of 5-11years. Not to mention all the crap they're fed including minced chicken. Thirdly, male chicks are of no use for egg or meat production, and are killed almost immediately after hatching; either thrown into a grinder (‘macerator’) while still alive or gassed to death- the preferred method in the UK. All with in hours of being born. More than 100 million male chicks are killed by the egg industry every year in the states alone. Male chicks are no good for the meat industry since chickens in the egg industry are bred to produce high quality eggs; the focus is not the quality of the meat. Fourthly, female chicks have the tips of their beaks sliced off with a hot blade without being sedated. This is done so the chickens don't hurt each other out of sheer frustration of their intense confinement. The beak is more sensitive than our finger tips loaded with pain receptors, nerve endings and blood vessels. Fifthly, eggs are pure shet. Slight exaggeration but whatever. Extremely high in cholesterol containing over 180mg. Recommended daily intake is 100-300mg. An egg contains about 6g of protein. 2 tablespoons of peanut butter contains 8g. A handful of brocoli/beans/couliflower/seeds/nuts/oats contains more protein. So what's the actual benefit of eating egg? Sixthly, chickens are smart, social, sensitive and blummin cute animals who deserve a better life. Animals are friends, not food. No bias. No agenda. 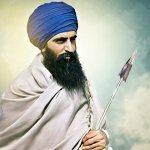 No gurbani. Just facts. I'm not for or against the consumption of meat/eggs but consumers should at the very least not be so willfully ignorant. Unfortunately we're all so far removed from our food and it's journey. Anyone with the knowledge and an ounce of compassion wouldn't go near mass produced eggs. If you own your own chickens and keep them in decent conditions, love and care for them, you may just get away with justifying consuming their periods. In conclusion, don't be a d*ck. Eat a gajjar. Crazed? This coming from someone who licks white a$$? Sure; sign me up to the madhouse. Unfortunately, they don't yet know about the Sikhs who colluded with the Germans and the Japanese We've fought tirelessly to freely practice our faith in this country and we continue to do so. Nothing was given to us on a silver platter. The british respect us dearly. They absolutely love us. Because the majority of us are like you- submissive, obedient lap dogs who've willfully forgotten our past in the name of integration at the expense of our future. These same dirt bags that you appear to worship sold the Sikhs out to the indian government in the 80's and continue to do so to date (i.e. Jagtar Singh Johal). Where is this respect and admiration you speak of? Bull$hit. Call me a bacha the day you learn how to spell and form coherent sentences. Complete sycophant white master a$$ licker. Highly educated? You're the furthest thing from it mate. Face-palm. And this my friends is what a bandar with an enslaved colonialised mindset looks like. Try as hard as you like to "integrate" into this british society, you'll never be accepted as one of them. "great relationship with the white people who respect us"... Jesus wept. S4NGH replied to Premi5's topic in WHAT'S HAPPENING? what is rabb da bhana?